I have always been a huge fan of handmade things, ESPECIALLY from my children. And since both my oldest children have been going to preschool since age 3, they have come home with some really wonderful things. I usually put them on the refrigerator so we can enjoy them. Most of the crafts are seasonal, so I like to save them and use them the following year (the ones that are in good condition after surviving the fridge) 🙂 . For the past 2 years, I have put all the crafts into a drawer until just recently the drawer became so packed that I could not add one more craft to the pile. I have always had in mind to get this organized but always put it off. So today, I FINALLY figured out what to do. 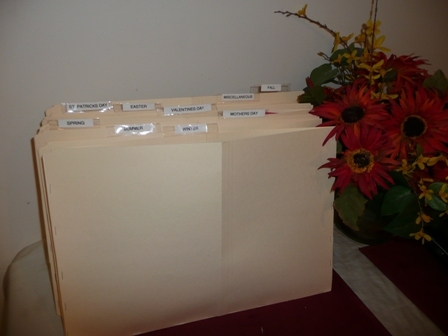 Initially I really wanted to purchase some kind of sectioned organizing system like a big box with hanging folders. But because some of the crafts are over sized, I knew that wouldn’t work. So I came up with the idea to buy poster board and fold it in half and staple it along the open edges so it would make a really big envelope. 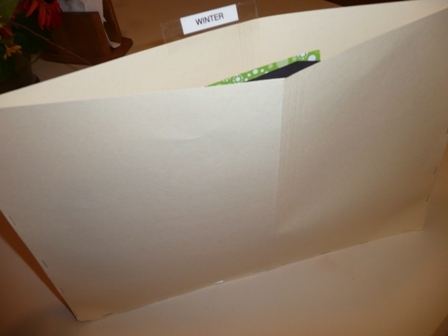 I would then have each envelope labeled for that particular season or holiday. But again, I have been putting off getting to an office supply store. When I woke up today, I was totally inspired to figure this craft thing out once and for all. I never got the poster board, but I realized that I had a whole bunch of manila folders that I was not using. I opened one up, cut off the tabs to make a perfect rectangle and then stapled it to another one on 3 sides leaving one side open at the top. I then took some clear packing tape and attached it to the back of the folder. I folded it over and stuck it to the other side and then added a label. I categorized the craft folders by both seasons and holidays. This is really going to help me keep the kid’s special crafts organized so I can enjoy them for years to come. And this doesn’t mean I will save absolutely everything. I definitely don’t want to do that. 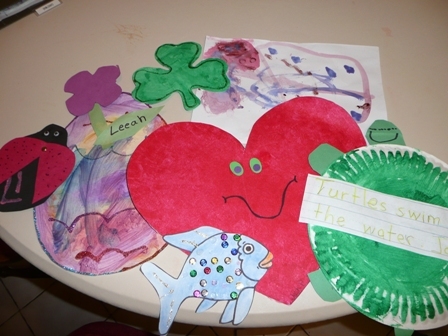 With 4 kids I am sure there will be hundreds of crafts over the years. I really want to keep the ones that are special. And as new crafts come in, I will be getting rid of some from the envelopes. But at least now, I can open up each separate folder at that specific season and use the crafts to decorate around the house. I am going to keep them in a cabinet so they can be easily accessed and not get ruined. So, what do you think about my kid’s craft organizational system? Do you think it is something that would help you? And if you already have a system, please share! Being a mom and staying on top of everything in our homes can be a huge challenge, especially for those of us that work. Whether you work in the home or out of the home – a mother’s life can be very demanding with all the responsibilities that we face. We still have to get the kids ready, fed, bathed, little ones kept occupied, have play time, cook meals, clean, do laundry, dishes, shop, and everything in between. I am a Work at Home Mom and with 3 small children and another on the way – I often feel like throwing in the towel. Sometimes I do fall apart, I think all of us have at some point. But then reality sets in and we remember that we have bills to pay and our busy lives must go on. But I have found that there are certain things that I can do to that really help me maintain a balanced life in spite of it all. 1. Keep a To Do List. Last week I wrote a post on this exact subject. You definitely want to Read the Post because it I share in detail how I organize my weekly to do list by category. I think it is the FIRST and most important thing that helps me to stay on top of everything in both my home and businesses. 2. Prepare the Night Before. This is big for me, especially during the school year. Mornings are always hectic for me, trying to get everyone ready, fed, and out the door. So, I try to limit the tasks that have to be done in the morning by preparing the night before. I set everyone’s clothes out, make the kid’s lunches, and I make sure bags are ready by the door (bookbags, diaper bag, purse, etc). This really helps limit the time it takes in the morning to get ready which is already a difficult task with multiple children. And throw a baby into the mix – there is way more to do in the morning! 3. Set Aside Tasks for Specific Days. I work better when I have a schedule. I do certain things on certain days. For instance, on Monday I do all the laundry. When my husband gets home we all fold the laundry together and put it away. This knocks out a huge task at the beginning of the week, so I don’t have to worry about it. That is one thing I learned, always do the task that you least like – FIRST. I carry that concept into other areas of my to do list as well. 4. Keep up with the Small Messes. As you know, with children (and husbands – LOL) there is ALWAYS some kind of mess to clean up – cracker crumbs on the carpet, marbles under the table, dishes in the sink, hair onm the bathroom floor, toys – toys – toys…. When you ignore it for even just a day, the mess becomes bigger and bigger and more unmanageable. I decided that no matter how I feel or how tired I am, I am going to stay up on the small messes. So, when I see something that is out of place I put it back. When the sink is full of dishes, I wash them. When the kids toy’s are laying around and they are not playing with them – I have them clean them up and put them away. I try to have them help me as much as possible even though sometimes it would be easier to just do it myself. 5. Set Limits. I can very easily get distracted by things that wind up taking up valuable time. For me, my internet community & network is very important in helping me build my business, but I can easily spend hours doing this without realizing it. Some of you may struggle with talking on the phone with friends or watching soaps on TV. Whatever it is that you struggle with, you have to purpose in your mind to set a limits for yourself. It is also good to set limits for your children. It is not good for them to sit in front of the TV all day while you play on the computer. It is not good for them to play video games for an extended period of time. If you cannot set limits for yourself, it will be harder to set limits for them. Start now! 6. Set Aside “Me Time”. This is one thing that refreshes me on a daily basis. I used to work at night. I felt like it was easier for me to get things done when the kids were in bed so I could focus without distractions. After a few months I nearly had a nervous breakdown. I wasn’t getting enough sleep. I couldn’t get up in the morning. I was cranky and tired all the time. So, I decided that I could no longer work that way. It was negatively affecting me and my family. So, now instead of working after the kids go to bed. I shut down the computer and I take an hour or 2 to wind down and watch some TV. I then get to bed early and get the sleep that I need. The next day, I am up early and ready to go with a clear mind and rested body. I have found that I am actually getting more done now during the day. I hope this list of Time Management Tips will help those of you moms out there who need help balancing your lives. Is there a certain thing from my list that you could work on? Please share! How do you balance home and work? I would love to hear from you! As many of you know, I am a Work At Home Mom (WAHM). I run 3 small businesses from home. I have 3 small children under the age of 5 and am pregnant with #4, so my life can get pretty hectic trying to balance it all. Over the years (and a few breakdowns later) I have had to learn how to balance my life through staying extremely organized. This is my longest section on my to do list. I sometimes have 10 clients in a week who have several different projects. Once a project is complete, I cross it out. Once all a clients work is done, I cross out that clients section with a diagonal line. This list can get pretty long. I include anyone from clients, friends, family, bloggers, facebook, etc. I get over 100 emails each day, oftentimes more, and I tend to forget who I need to respond to. So, if I keep a list I can stay up on this. I may not get the email out for a few days, but at least it helps me to remember that it needs to be done. I list all of my blogs and what I need to post about. This is a running list, because I will come up with ideas and not always get to them until weeks later. I try to post on my blogs at least once a week. My Painter Mommy is my main blog, so I post there more often and have more to do as far as responding to comments, running giveaways, etc. This list changes each week. I try to do one major chore in the house each week such as clean out my fridge, pantry, go through the kids clothes, clean the bathroom, dust, etc. It has been hard to keep up with this in the summer with all the kids home, but I try to squeeze these things in where I can. Once the kids are in preschool full time in September – I am hoping that I can get back on schedule with my home chores. I keep this list on one large sheet of paper in a special notebook that has 12″ x 12″ lined paper in it. I love it, because I split the paper into 3 sections with lines and then have two sections for clients, one section for the home stuff, blogging, etc. I start my list on Sunday afternoon or evening in preparation for Monday. I go over the to do list for the previous week and carry things over. I go through my emails to see what work needs to be done and who I need to respond to. I think this is great because then on Monday morning I can immediately get started without wasting time planning the week out. 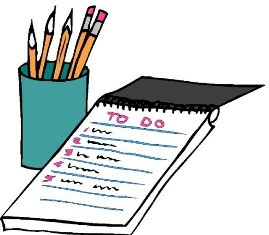 Keeping an extensive to do list really helps me to stay balanced and to always remember what I need to do. I breathe easier having a plan. When I see it all in front of me, I can stay focused on the task at hand. At the end of each week, I feel so good seeing all the things that are checked off and completed. It is a feeling of true accomplishment. We have lotions, make-up, hair accessories, nail polish, and the list goes on! And how about the men – they have STUFF too! 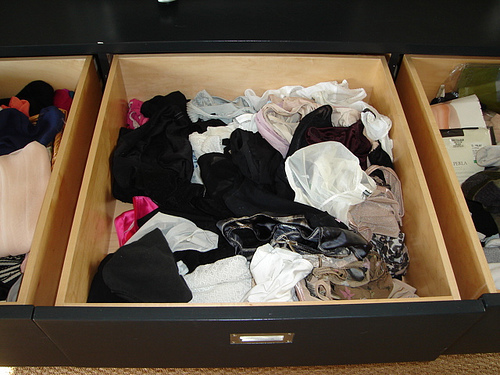 What can be done with all of it if you don’t have the space to store it and keep it organized? I will be the first one to tell you that keeping it displayed on the counter is NOT a good choice. Trust me, I used to do it. My mom would come and visit and always comment on the fact that there wasn’t any space at the sink. So, I had to get my act together and come up with a plan. In this video (which if you are a subscriber you have to click on the post title to go to my site and view the video)…. OK, so in this video, I share a few simple organizing tips that helps me to stay on top of all the bathroom STUFF. 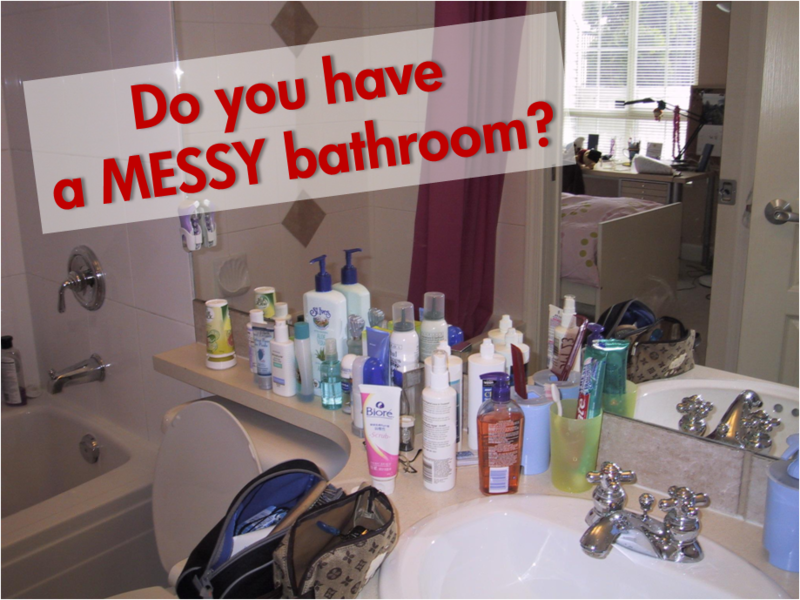 Do you have a messy bathroom? What do you do to keep all your bathroom STUFF organized?